I’m looking forward to racing today. It’s a reunion with Team Rionie (Rich, Leonie & Reed Alesci) and our friend Charity is racing her first 5K. I am a little apprehensive however because I’m physically fatigued. Yesterday, the girls and I took a day trip to the Bay Area to visit my old roommate Teresa (Clark) and the Ridder Family. It was a great time but I didn’t get much sleep. I even took a “nap” on the way to the race. I don't even want to think about the long bike ride back from Sacramento to home afterwards. We register and meet up with Charity at the start. Troy and Charity warm-up while I hang out with 5 kiddos, mine plus hers. Ariel is in heaven because she gets to hang out with her buddy Moriah. I find Leonie and Rich and hang out with them a bit. Troy was supposed to do the 10K with me but he is nursing a hurt calf/hamstring. So the 5K is better for him. 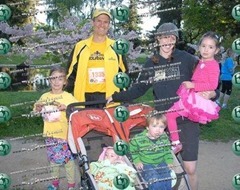 The 5K goes great for Troy, Charity and Leonie. They all finish strong! Troy ran pain free…praise God!! Charity finished 4th in her age group and Leonie finished 6th! A great way to start the day! Time for my race! I warm-up and head to the start. My goal today is to run 7 min pace. Troy comes over to pray with me. It’s just what I needed…love him! My mind is reset and put back on Christ. This is His race. Troy heads out and reminds me to stay right so I can give some high 5’s to the girls. Ready, set, go! I see the girls waiting for me and I make hand contact…yes! I see I’m going too fast so I pull back and keep an eye on my watch. 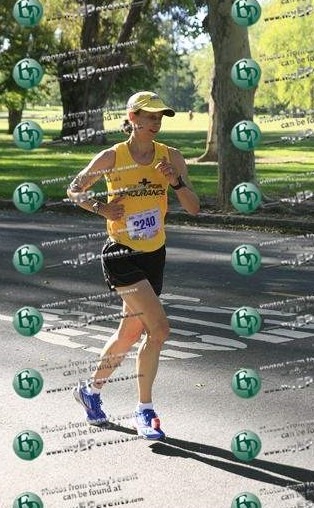 I can see a bunch of girls ahead of me and for now I’m content to let them stay out there until I figure out my pace. 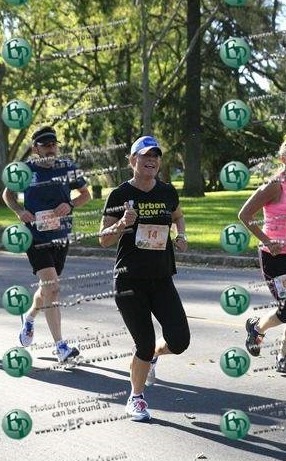 I see Leonie and Reed cheering for me. Reed is so cute clapping along with his mommy! Mile 1 is 6:59. Good, right where I want to be. Some of the ladies start coming back to me and I start to pay attention. There is a Fleet Feet girl I start to real in. Mile 2 is 6:57. I catch up to the Fleet Feet girl. I tell her good job. I look ahead and can see a yellow GVH (Golden Valley Harriers) jersey. I remember racing that gal recently but cannot remember where. It would be cool to catch her but Lord I’ll be content if I don’t. For now there is a River City Rebel racer I’m working to catch. 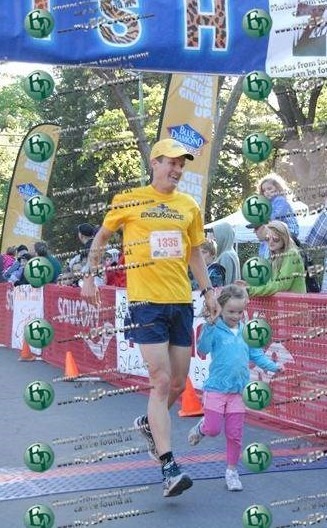 As I’m heading back to complete lap 1, I see Troy and the girls cheering. What a boost as always! Troy tells me I’m 14th. Cool! I pass the RCR gal as she is cheering for her teammate Karen. I remember Karen joined us at our track workout a while back. Wow, she’s really up there! Mile 3 is 6:52. Wow, thanks Lord for the energy. I’m halfway and know I could fall apart any moment…yet, I clearly see 6 girls not too far including the yellow gal. Lord, I’m going to keep pushing and see what happens. I could get top 10! Mile 4 is 6:51. Alright, holding steady! I’ve caught up to 2 girls now. I feel like I’m loosing energy so I take a Hammer gel. I start to feel a bit stronger so I pass the girls. Mile 5 is 6:56. Slower but still under my goal pace…yeah! I remind myself that it’s almost over and to dig deep. Lord, You are my strength…we can do it! I real in the yellow gal and 2 others. There is one more girl left and she’s not slowing down! I keep pushing and very slowly close the gap. The finish is so close now! Mile 6 is 6:39. Wow, thanks again Lord! I push but it’s going to be too late to catch that girl. I see Anna waiting to finish with me. I tell her to start running. 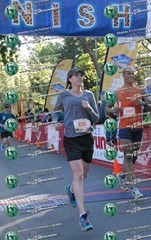 I know those girls I passed are not far behind and I want to make sure Anna and I can stay ahead and out of their way. 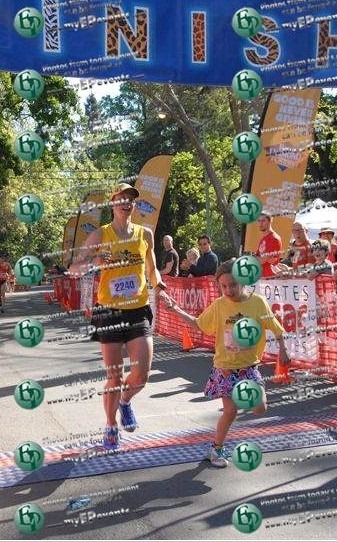 Anna digs deep and pulls me across the finish line. I hug and thank her for the help. 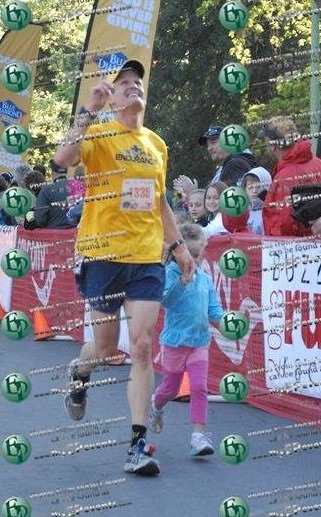 We just barely beat the next girl by 6 seconds! Wow that was tough but a great effort! Thank you Lord! Now it’s time for the Zoo and the kids races! Yeah!